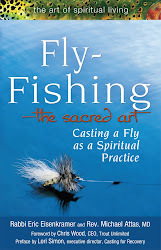 This article on The Fly Fishing Rabbi is by Dr. Michael Attas, a practicing cardiologist, professor and an ordained Episcopal priest. He has avidly pursued fish with the magic of flies all over the world for 40 years. Dr. Attas also writes a column for the Waco Texas Tribune on health, ethics and religion. Several years ago I was sitting in the Houston Intercontinental Airport when my cell phone rang. It was the wife of Will Spong, who was perhaps my closest mentor in my dual life as a physician and priest. Will was my seminary professor, pastoral counselor, and one of my closest friends. He was found dead in bed that morning, and my world began to spin out of control. Will was the brother of the Rev. John Shelby Spong who authored “Rescuing the Bible from Fundamentalists,” and was the person most responsible for my decision to pursue ordained ministry while continuing a life as a practicing physician and professor. We had just shared a long lunch a few weeks before, and little did I know then that would be the last time I would see him. 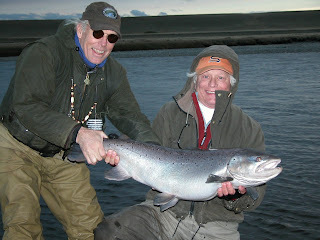 When Nancy called to inform me of Will’s passing, I was on the way to Argentina to pursue the legendary sea run brown trout of Tierra del Fuego. I wanted desperately to cancel the trip to be with friends and family of Will to celebrate his life and ministry. Yet Nancy told me unequivocally to go fishing-that is what Will would have wanted for me. So I went fly fishing—to the land of eternal fire where large fish morphed into something glorious to rule the rivers and oceans. Two days later, I was in the middle of the Rio Grande River when the reality of Will’s death hit me. I began to heave with sobs of loss, of injustice, of Wills pure and simple absence. I went to the bank to collect myself, fearing that if I stayed in the water I might lose my balance and go for a cold swim! Within a few minutes I began to feel a peace, a calm…what I would describe as a peace that passes all understanding. I looked across the river, and my eyes beheld the most glorious rainbow in the sky that I’ve ever seen. Now this was more than a bit unusual, for it was not an arched rainbow reaching from cloud to cloud, but a vertical rainbow reaching from heaven to earth, like a multi-colored thread reaching from the divine into the heart of the human condition. And I heard with the clarity beyond words Will’s voice inside my head saying “Mike…it is fine. All will be well. Relax and don’t worry”. The words of the 14th century Christian mystic Julian of Norwich echoed in my mind when she looked into a simple chestnut and saw all of God’s creation and wrote “all will be well, all will be well.” It was nothing less than the simple assurance of the presence of creating God who undergirds his story with an outpouring of love into the human condition. In Mark 15:38 the author writes that when Jesus died “the curtain of the temple was torn in two, from top to bottom”. In ancient cosmology, the heavens and earth were seen as separate realms, and the temple curtain was a symbolic way to keep something purely holy from the rather profane and earthy world. Mark’s words are a way of saying that the divisions between God and humankind will never be quite the same. The barriers are rent asunder. God has chosen to enter into the rather messy, painful, real world where humans live, love, work, are wounded—and yet who keep surviving and loving despite unbearable loss and suffering. The Celtic Christians of the first few centuries felt that the world is graced with “thin places” where the divine and human can more closely come into some sort of connection with each other. These are “liminal” places, and they exist in all sorts of strange and wonderful and glorious spots. Sometimes they are in churches or temples or synagogues. Sometimes they are in the fields we plow. Sometimes they are in our kitchen or our hearth where we are welcomed home. More often they are in the world where we all live daily. These are places where we experience the reality of God more purely, more certainly, more radically, more authentically than in other places. And for me rivers are often those very thin places. Like the river in Argentina, they are often places where my mind and body can get out of the way and God can flow in. Unobstructed with the clutter of my life, I find myself listening more intently to the voice that is calling me home, to the very ground of my being. A thin place, yes-- where rivers and fish remind me of love and loss and hope and glory and the possibility of redemption. They bear stories of friendships beyond words. They carry our memories, our hopes, our fears, and our dreams. The thin places of rivers and fish are where we often find our truest self, the one hidden to all but the Holy One. I spent most of my life studying and counseling about death and dying. When my oldest child died at 32yo, all of it went out the window. I find that I can't see a squashed squirrel on the road without tears starting. It's like what happened to Kubler-Ross upon her mother's death. I still haven't relaxed from it. I am certain, on one level, of her continuation, and on another, Kierkegaardian level, all cast adrift. I've jumped, because there is no choice, but I'm really in fear. I am so sorry to hear of your loss. What a terrible tragedy. I hope that someday you find comfort. I have only been flyfishing for six years now but when ever I am on a river or stream I get a certain sense of awe and also calm. I call this feeling the zen of flyfishing and relish it. It wasn't until I discovered this blog that I could put it all in perspective. Hearing a Rabbi and a minister discribe flyfishing in a spiritual way connected the dots together for me. Flyfishing is a spiritual experience. For me that thin place the Reverend describes was standing in a meadow up in Yosemite and hearing a etherial sound. I thought it was just the wind whistling through the trees. In reality, it was the voice of G-d speaking. Life hasn't been the same since. Nice story. 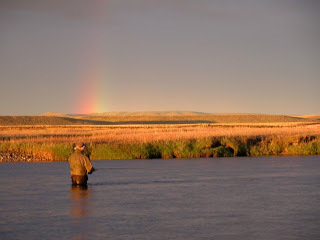 Though I don't believe in a Judeo-Christian God, I find that anything, like fly fishing, that connects me to the good and beauty in the world is spiritual. I became an angler after my mother passed away and I didn't know where to turn with my grief and, yes, guilt. It was then, probably for the first time in my life, I appreciated the beauty of a river, of a sunset. Who knows, maybe Spinoza is right: God is everywhere. This week one of my fly fishing friends passed away suddenly. I can relate to his sense of loss, and also to the solace found on the river. I suupose I am not the most spirtual person going and less than an a particularly observant Jew. But I have a belief in god and that there is a reason for everything. Your story really hits home because when I am alone fishing on a river of solitute I think of my departed father. I remember the day he died my brothers and I gave in his last martini in a syringe in his mouth and he died a few hours later with a smile on his face. My father loved martini's and told people to do what they loved to do. Just like your friend wno told you to go fishing.